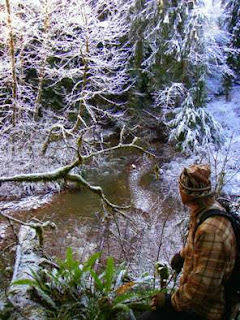 After the first snow hit in mid-December, Jason and I went out looking for tracks. We had high hopes to see some in the woods, but we came across a carnivore trail just as we crossed the driveway. This hunter had come the night before (we think, no snow in the tracks) and laid down right next to our little pond. Then he/she got up and walked down the south trail. What do you think it was? We followed this fellow mammal on the south trail and down to the creek. We lost the trail at the creek's edge, thinking it may have crossed. After examining the site a bit, we realized that there were no visible tracks on the other side of the creek. Also, the creek was deep and the wide at this spot. It didn't seem like a smart place to cross. We considered the possibility of the animal walking along the creeks edge, possibly searching for shrews or thirsty mice. When we got to the log bridge, we discovered that we were correct. Back on the trail. We moved slow along the shore because of the dense vegetation that our friend was moving through. A half a mile and a shirt full of snow later, we abandoned the chase. After lunch we booked it to Tomtit lake and on the way spotted a red-tailed hawk, raccoon tracks, and possibly some rabbit tracks. 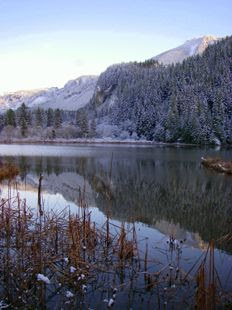 There was a feline trail crossing the rickidy bridge at the wintry lake. On our way back from Tomtit we came across what is called a "gap jumper" trail made by otters and/or raccoons. This is a trail used over and over again to move from one body of water (swamp in our case) to another (McCoy creek). Once we got back on the main logging road, we noticed a footprint on top of Jason's from earlier. 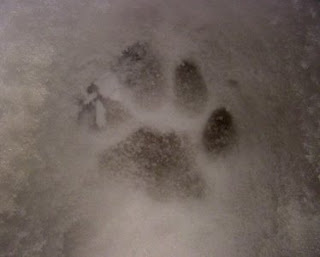 It was the footprint of the same species we were following all morning. Right then our eyes and ears perked up. We fell silent and moved slowly toward home. On the way we saw two black tailed deer (doe and fawn) pop out onto the road ahead of us and pronk off into the forest. Ten seconds later, a coyote came out where the deer had. The animals were becoming active again. We saw another footprint, on top of one of mine this time, when we were about half a mile away from home. When I arrived at the house I heard the news of a bobcat sitting in our pasture less than 20 minutes before! Who is the superior creature here? The bobcat had successfully hunted our pasture, digging up some rodent and leaving only a stomach and a few drops of blood behind. What a day at Alderleaf! Love this story. Good photos and text. Nicely done!